Summertime is a great time to enjoy the outdoors, so today I'm excited to share with all of you a fun giveaway to help you do so a little more comfortably! Good luck!! 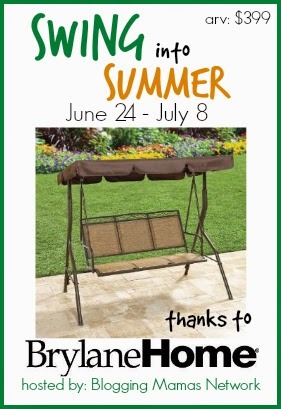 Welcome to the Swing into Summer Giveaway, hosted by the Blogging Mamas Network and sponsored by BrylaneHome.com. There's no better way to spend summer than to be outside so we're celebrating the season with a fabulous giveaway! Brylane Home has everything you need to get your summer started. Need to re-do your patio? They have the most fashionable patio sets around. Looking for lovely entertaining sets for a 4th of July Summer Cookout? They have you covered there too! Even though it's hot, you can still enjoy the outdoors when you're swinging into Summer with the Extra Wide Textured Vinyl 3-Seat Swing from Brylane Home. This swing is a great addition to any yard or deck - doesn't need any extra pads as the seats are made of a weather-proof PVC-coated mesh fabric that dries quickly and allows air to circulate—keeping you cool! The steel tube frame is made to hold 3 people and up to 450 pounds. 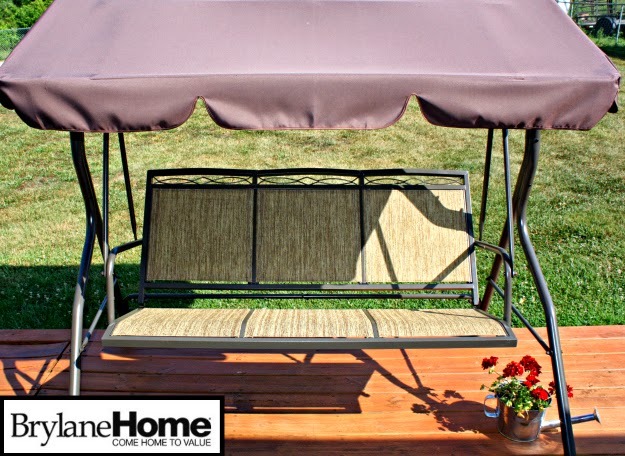 The attached, adjustable canopy provides shade just where you need it to keep you swinging all summer long! Want to see even more of this swing? Lindsey from So Easy Being Green has a full review of the Extra Wide Textured Vinyl 3-Seat Swing for you! The Family Swing retails for $399.99 but is on sale at Brylane Home right now for $199! Head to Brylane Home and let me know what other item would make your Perfect for Summer List! Who's ready to WIN this swing!? This giveaway will end on July 8th. It is open to US residents, 18+ only. Please use the Giveaway Tools widget below to enter. Disclosure: I did not receive any compensation for hosting this giveaway. Participating bloggers are not responsible for prize fulfillment. I would love the retro double gliders. I like the Resin Rocker.